The award-winning Mohu ReLeaf is the only indoor antenna on the market made from recycled materials. FSC, Green Seal and Green-e Certified, ReLeaf is made with 100% renewable electricity, chlorine free post-consumer colors (PCF). Created from literally crushed cable boxes and 30% post-consumer recycled cardboard, ReLeaf helps lower energy bills and reduce waste. Additional waste is minimized in ReLeaf's packaging - instructions are printed directly on the box and the packaging is made from 100% recycled cardboard. Like other Leaf antennas, ReLeaf is reversible, paintable, and omnidirectional. With an included 10 foot high performance coaxial cable, you can flexibly place ReLeaf in your home. There are no exposed or distracting antenna parts. ReLeaf can be easily hidden behind a picture, bookshelf, or television. With ReLeaf you no longer have to pay high monthly cable or satellite bills to enjoy your favorite shows. ReLeaf can pull in your favorite local and national news, weather, sitcoms, kids’ shows, TV series and sports programming with NO monthly contract or bills. ReLeaf can find all available over-the-air broadcast TV channels within a 30-mile radius of your home. Disclaimer: Channel reception will vary based on what is broadcast in your area, your distance from broadcast towers, and any geographical obstructions between you and the towers. Before you buy, use Mohu’s web tool to see what channels are available in your area. Channel reception depends primarily on geographical location and terrain. ESPN and FOX News (among other paid cable channels) are not available via free HDTV broadcast. Email us at support@gomohu.com for help setting up your product. 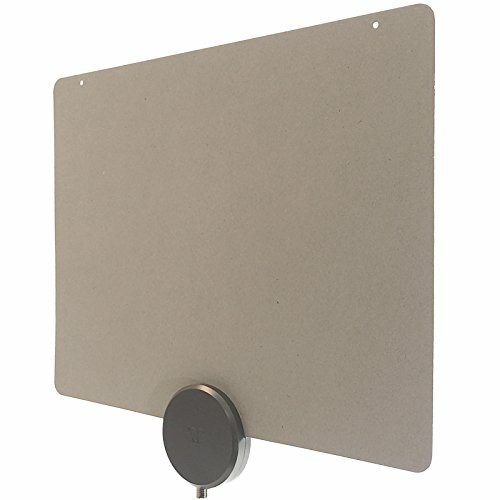 World's first recycled HDTV antenna: Made using plastic from 100% recycled cable set-top boxes to minimize our environmental impact wasting less energy resources and money. Free TV For Life: Now tested to reach up to 40 miles ReLeaf can access HD Over-the-Air TV channels without a cable or satellite subscription including ABC CBS NBC PBS Fox Univision and more. Multi-directional and Reversible HDTV Antenna: ReLeaf was designed to blend with popular home paint colors. Place it anywhere no pointing" needed. 10 ft. high performance cable included." ReLeaf Designed and Manufactured in the USA with a 1-year warranty.